Possibly one of the more wide ranging stats that AD&D uses, but the one with the least misuse. It still may harbor a surprise or two, so let’s take a closer look. Previously we looked at Strength, Intelligence, Wisdom, Dexterity, Constitution, and now it’s time for the “dump stat” or is it a dump stat? Charisma is the measure of the character’s combined physical attractiveness, persuasiveness, and personal magnetism. The paragraph goes on to acknowledge that characters can be charismatic but not physically attractive. So again Gary knew he was summing up various aspects of a person into one stat block. Indeed later on in Unearthed Arcana, the Comeliness stat was added. This was used to describe a characters physical attractiveness. The charisma table sets racial and class limits on the numbers. If this doesn’t inspire you for a villain of the most vile traits imaginable… I don’t know what would. So how do you screw this up? The Henchmen aspect of Charisma often gets confused. It is NOT the number of workers, servants, or people in the characters employ. Henchmen are Non-player-characters who serve as permanent retainers. Another mistake we often make with Charisma is to assume it is what we call a “Dump Stat”. Which is, all the other stats that affect hitting and dodging were attended to, then whatever was left over was ‘dumped’ into Charisma. It was not considered an essential piece of the game. This should be a clue to DMs. This becomes a center stage ability if you USE it as intended. Getting clues from townsfolk, allowing parlay in the dungeon, an investigation section of your quests suddenly make your players rue dumping their worst number into the CHR. block. Many Old School players often blend this stat into simple physical appeal. indeed that is PART of the stat, but not all of it. 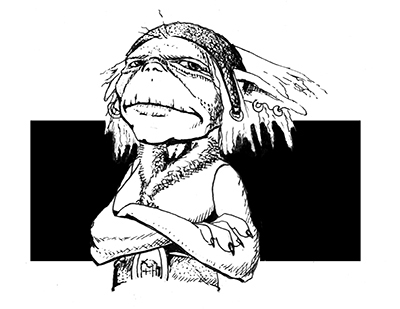 a Goblin can be a charming sort, especially to other goblins. Which brings us to the notes below the Charisma table. The racial maximums on Charisma ONLY apply to those of different races. A Dwarf with an 18 charisma still has an 18 charisma as far as all the dwarves are concerned. The humans and other races will only perceive it as a 16. This exception also applies to half-orcs. Have you used Charisma as a Dump stat? Did you need to house-rule it? ← What did we Learn from Constitution?